Edited by Sverre Planke, Anders Malte Sørensen, and Bjørn Jamtveit. The influence of volcanic processes on petroleum prospectivity is a major challenge for oil and gas companies exploring volcanic basins worldwide. The Sill Atlas is a multi-disciplinary study documenting the results of a five-year integrated geological, geophysical, and computational modeling project. The main report gives an overview of the results from the project in A3 atlas format. 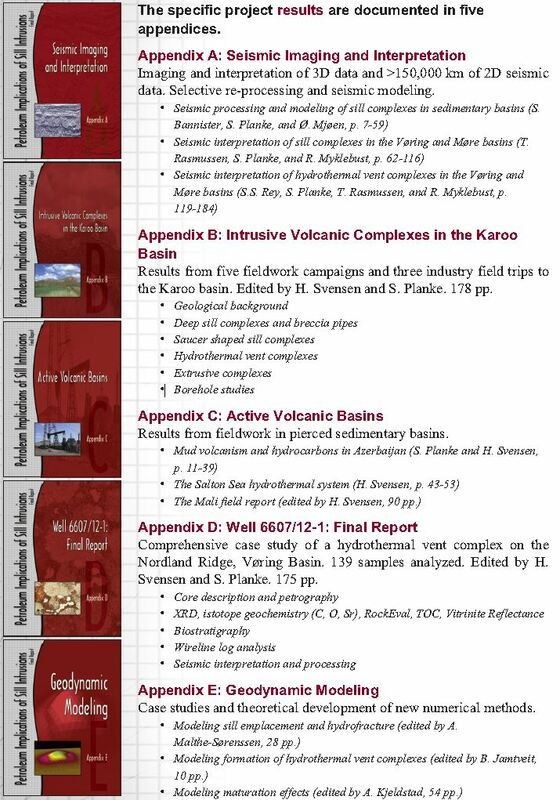 It presents the main results and conclusions, and is a good tool for scientists who want an introduction to sill intrusions and its aspects for petroleum exploration. The results are documented in detail in five appendixes. A license to the project gives access to the latest research results, presented in paper reports, PDF format (CD-rom), oral presentations, courses and field trips. The people behind the project are leading scientists from university and research institutions. They have expertise in different fields such as geophysics, geology and physics. The five appendices included with the report.